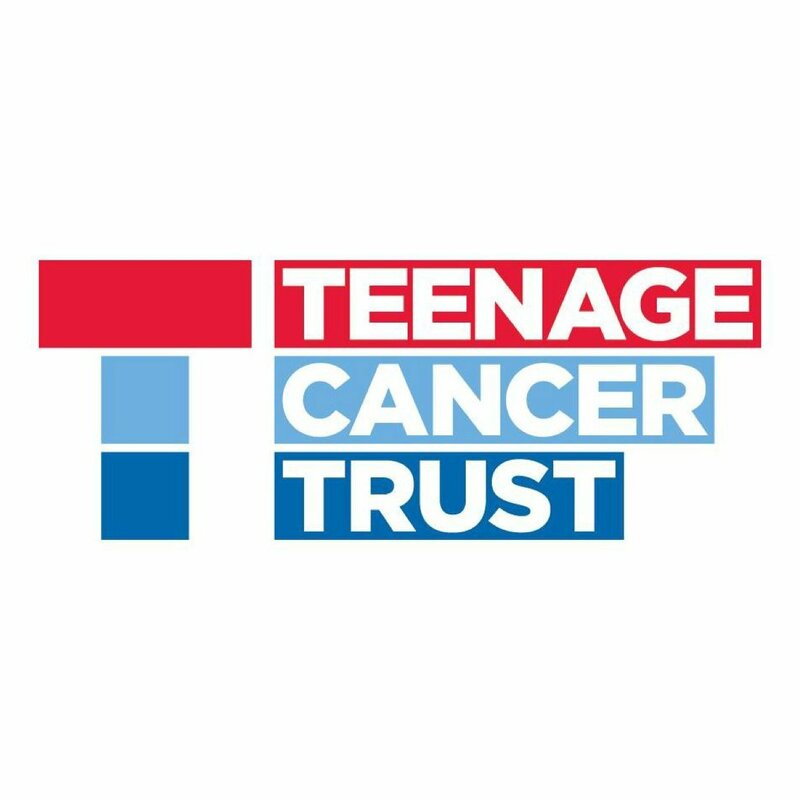 What the Teenage Cancer Trust did for me! By the time I have completed the Bolton Ironman I hope to have raised a hell of a lot of money for Teenage Cancer Trust. Therefore, I want to explain what they did for me and why they deserve your donations. Finding out you have cancer when you’re 20 is, as I’m sure you can imagine, f*cking terrifying. Whilst my friends were worrying about exams at uni, I was facing the ‘c word’, but TCT made my experience a lot better than it could’ve been. Within a day of finding out I had Leukaemia at York hospital I met Diane, a nurse consultant, who ended up playing a huge role in my treatment. She came into my isolation room and that was the first time I heard about Ward J94 in Leeds St James Hospital. Diane strongly suggested that I move hospitals to become part of the TCT family. At first I was very hesitant. I couldn’t help think why should I move? Why would I want to be further away from my family?… However these thoughts didn’t last long. Moving to J94 was the best decision I’ve ever made. To put it into perspective, I moved from an isolation room the size of a large cupboard, where my family had to wear aprons and gloves, to being able to have them to stay and spend the day playing pool with them. 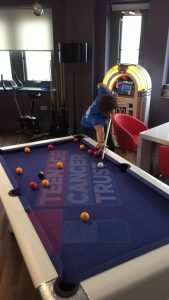 The Teenage Cancer Trust Young Adults Unit at St James Hospital is for people aged between 17-24. They fund two expert staff on the unit, one being a nurse consultant, Diane. She was there to answer any questions my family and I had, and still gives me a lot of support. The other, a Youth Support Coordinator, otherwise known as Carrie/Darren. She/he organised stuff to keep us busy, Friday brunch and Thursday pizza nights were definitely a firm favourite. Baking and painting pottery…not such a high point for me, but I did it anyway. (My mum on the other hand, is very happy with her poodle mug) Along with providing these experts TCT have made sure that everyone on the ward has a TV in their bay with its own DVD player. There are two bays that hold three people each and they have three isolation rooms. One of the main advantages of this ward was that they allowed visitors whenever. In each bay there was a chair that could be pulled out and turned into a bed. It has to be said, the isolation rooms did have the comfier sleeping arrangements but it came at a cost (You’re normally very ill and feeling like sh*t when in a side room, so your guests actually don’t get much sleep). Allowing people to stay for the night helped me so much psychologically. If ever there’s a time you need someone you know by your side looking after you, it’s then. J94 also have an amazing day room. There’s a pool table, which I have had legendary matches on. They have a large TV that has all the Sky channels and they have every gaming console you can think of. Something I did take for granted, and so did everyone who came to visit, was the free wifi. I cannot understand why all wards do not have it. 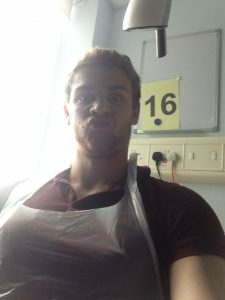 The one place where life would be so much easier with the Internet is hospital, but yet it’s the only place without it. 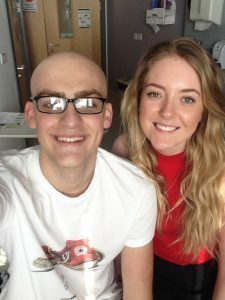 The most important thing that the Teenage Cancer Trust did for me was to give me an escape. Even for just a few seconds. They distracted me from what was really going on. Watching TV, Face timing friends and family, having a game of pool, these were all things that made me concentrate on something other than cancer. For that I am so thankful. If it wasn’t for you TCT I truly think I would have gone mad and my treatment would have been so much harder. A huge thank you to Diane and all the support staff!